So, when the school year started, I was all about scaffolding. I would do this, and my students would do that. I’d provide, build, prop, support until my students were writing their souls onto the paper. Good idea, right? Yeah, it worked about two weeks. Then, I realized my students were bored. No matter how much I tried to get them interested in doing the learning my way, they were all about doing the learning their way: they wanted me to “get them started” and then let them GO. Since I am a control freak, this presented a problem. What if they did the work wrong? What if they didn’t learn the skill I needed them to learn? What if I couldn’t stay on the carefully crafted schedule I’d created? Yep. That last question—see? There’s the problem. I wanted the learning to be about me. My schedule. My way or the highway. I had to learn to let go and let them. My approach to writing instruction changed. Instead of pounding my students sweet heads with pre-writing strategies, although colorful additions to their writing notebooks, I started more carefully following the advice I’d learned from great coaches like Jeff Anderson, Penny Kittle and Cris Tovani. One thing I changed: I started using better mentor texts. I found pieces of writing that included the skill I wanted students to learn, pieces that were inflammatory or insulting—you know, writing that made students crazy with the need to respond? Pieces that made students think. We’d read these pieces together, and then I’d ask the students questions that helped them discover the writing skill in the piece. Inevitably, students will find what I hope they’ll find—if the mentor text is a good one. And hey, why don’t we get real about this? Most rich folks paying 28 percent taxes do not give out another 28 percent of their income to charity. Most rich folks like to keep their dough. They don’t strip their bank accounts and investment portfolios. They keep them and then pass them on to their children, their children’s children. And what they do give away is—like the monies my wife and I donate—totally at their own discretion. That’s the rich-guy philosophy in a nutshell: don’t tell us how to use our money; we’ll tell you. The writing devices in this excerpt scream to be discussed: Hello? Tone, Dash–baby, Word Choice Wonders, Asyndeton’s a-list, Repetition-Repetition, and more! If I trust my students to search, find, think, and discuss what makes this writing effective—they will. Then, not only can I encourage my kids to use devices like this in their own writing, I can craft questions that get them thinking about topics to write about. Voile! My mentor text is now an ideas generator. Questions like: What kind of story might be titled “One Single Red Penny”? What topics emerge from these paragraphs? Why should you care about United American citizenry? What are some things you’d like people to “get real” about? What are some things you consider “annoying responsibility stuff”? What are some treasures your family passes down from children to “their children’s children”? My students will get into these questions, and look at all the different types of writing they can produce just by thinking about these topics? Literary, expository, persuasive. Thinking. Maybe that’s the deal here. When I provide too much scaffolding, my students do not have to think near as much as when I let them struggle through. 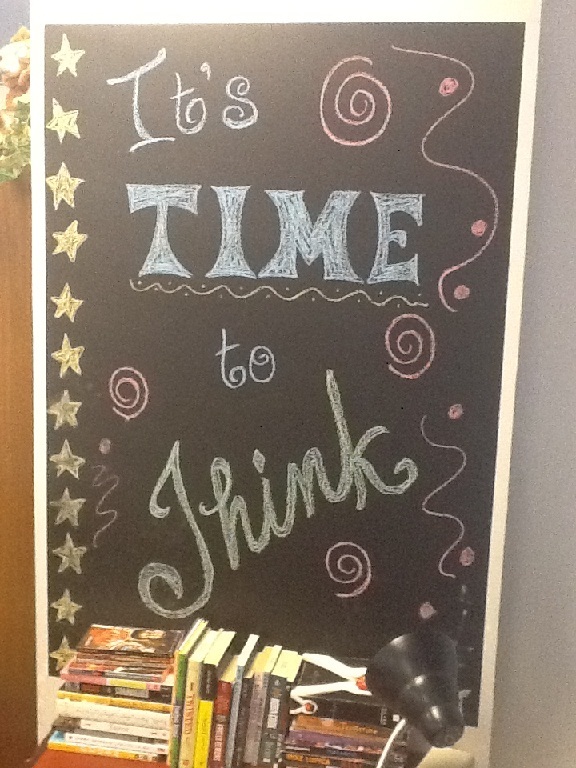 In the rear of my classroom, I have a wall painted with chalkboard paint that says in colorful fancy letters: It’s TIME to think. Maybe it’s just me, but thinking equates to struggle, and I am pretty sure that’s where the learning is.